VB is pleased to bring readers a new, notable paper in virtual law, Leave Those Orcs Alone: Property Rights in Virtual Worlds, (.pdf) by UCLA law student Kevin Deenihan. The paper argues that virtual worlds and games should be essentially free from real life legal intervention. In reaching this conclusion, Deenihan provides a solid overview of the existing arguments against commodification, and adds several wrinkles of his own. His big-picture look at the assumption that real life law should apply to these spaces should resonate with both developers and users who advocate in-world solutions. Players and their characters earn virtual property to socialize, for fun, or for status, not for protection or investment. Shoehorning in a legal system that protects investment and ignores the value of fun and communality would do terrible violence to these societies. Far better utility results from allowing users and developers to continue elaborating on their quasi-legal systems in peace. Among many other intriguing points, Deenihan argues that real world legal intervention is more likely to result in rules that benefit bad elements than average users. The litigants with the most incentive to sue, and thus to have their interest recognized, are typically those whose role in Virtual Worlds is considered negative by wide swathes of the playerbase: gold farmers, account sellers, and exploiters. The paper is to some degree at odds with much of the recent academic literature on legal issues in virtual worlds, and indeed, with the very premise of this site. Most writers, including VB’s editor, take commodification and subsequent legal intervention as a foregone conclusion at this point. That is in no way a criticism of the paper — Deenihan raises questions that are fundamental and important, and that are all too often overlooked. Deenihan is a student at UCLA School of Law. He is a native of the San Francisco Bay Area, and graduated from UC Berkeley with an Economics degree. His main is a Paladin (and if you don’t know what that means, you need to spend more time “earning virtual property to socialize, for fun, and for status”). With Deenihan’s paper, VB is launching a new feature, “Reading Room,” where we will periodically feature notable papers in virtual law which are, at least for the moment, exclusively available here. If you have written or are writing a virtual law-related paper that you would like to have hosted at VB, email the editor for more information. on 16 Jan 2008 at 8:19 am2 Virtual Worlds Forum Blog » Blog Archive » Leave Those Orcs Alone: Should real-world law intervene in virtual worlds? It is totally wrong to lump in legitimate players who play to accumulate points, or even for profit, with people who deliberately compromise the game system. on 18 Jan 2008 at 9:22 am4 Kevin! I enjoyed the article very much, it was good to see considered intelligent analysis with footnotes! I think fundamentally I agree with the conclusion “it is not yet time, if it ever will be, to bring in the majesty of the law”. Although I think I come at it via a different path. The article observes that ‘Linden Labs paid a high price for their bifurcated strategy.’ I think this is the key. LL’s invited tries to have its cake and eat it two. It tries to avoid the ‘unexpected expense for delevopers’ by just not bothering with enforcing ToS elements, copyright it doesn’t want to enforce. But by moving away from a game to be a place where you can make real money they are really begging the ‘majesty of the law to come in’. It has been suggested that much of the analysis in the article of the game elements and drivers could be used to argue there is no intention to create legal relations. I personally think LL’s removes this possibility with the real money selling pitch, morally if not at law. They may well find that their unwillingness to be the law, which essentially they could, and perhaps on my view and as a reasonable conclusion from the article they should be, will result in them being the victim of the law, to a much greater extent that would ever have been possible had they opted for a more hands on approach consistent with the ToS. excuse all the typos my proofreading assistant is on strike. I appreciate Deenihan’s point that legal process would most likely be initiated by those with a real money financial stake in the grey market. However, this assumes that the shaping of virtual law mirrors real world law, instead of acknowledging the differences between real-world property owners and a virtual world community. Deenihan’s assertion that the grey market is a victimless crime (“The only losers under the present system are the few that are scammed or banned for illegal activity.”) Is egregiously wrong. Gold-farmers and botters accrue gold much faster than people who handplay a game, and people who buy the gold have more resources than people are otherwise able to earn through normal hand play. Gold-farmers and botters also have a tendency to camp good spots and bosses, blocking game progress for players who hand play. 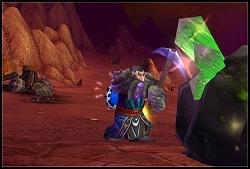 The influx of grey market gold inflates the in-game economy, making it difficult for non-cheating players to acquire the equipment they need to proceed to higher level maps. Therefore they both can’t afford to buy the equipment through normal gaming activities or go to the maps where they might hunt for the equipment they need. Non-cheaters will have to “grind” more and level slower because the best virtual space is taken up by gold-farmers and botters. The only people who can viably compete are those driven to the grey market for the gold to buy equipment (which they often ironically buy from the same botters who sold them the gold, so the botter can both exploit the inflated economy to set high prices and keep reselling the same gold). MOREOVER, once the grey market ruins the game economy and creates a sufficient amount of desperation among players who discover that they can’t proceed through normal play, the game publisher can exploit that desperation by offering the needed equipment for direct cash sales. They can make even more money by running pyramid schemes where players have to keep buying upgrades for their items (usually disguised as Events, which hide the amount of previous investment made in the items – re: cost of all upgrades added together). Or they can offer the mere chance of getting the item in a “surprise box”, where players could end up paying 40 times over before they get the item they need (appropriate for their class, skills/stances, etc.). Currently game publishers have a VESTED INTEREST in “underenforcing” because the harm caused by botting psychologically manipulates players into spending money over and above their subscription. Even if they recognize how they are being manipulated and ripped off, players are unlikely depart in protest because of their attachment to the community. Game publishers seem to be banking on the idea that games have a short-lifecycle and the peak needs to be exploited with short-term strategies. Another thought to keep in mind is that much of the online gaming population is relatively young, and quite a portion are minors without access to legal process to vindicate their rights even in real world transactions. These children spend the last penny of their allowances for “top up cards” or “game time” or “e-load codes”. They are exceptionally vulnerable victims in the grey market, when they meet some blackmarket dealer in a shady game shop and hand over real cash. Because they are minors, their transactions should be somewhat protected. Right now both game publishers and grey market exploiters are free to deprive inhabits of virtual worlds of advertised expectations, and effectively withhold the promised goods/experience until extra bribes are paid. I agree the court system isn’t the most efficient way to solve the problems that arise in virtual worlds. These days they aren’t even the most efficient way to handle real world problems. However, some vehicle to protect and defend the rights of the inhabitants of virtual worlds must be evolved. Ad hoc player negotiations and forum discussion simply does not work because the players have no power. The case of Singapore Granado Espada, which I brought up in my other comments, prove that there’s no real “moral pressure” on developers or publishers to engage in expensive enforcement of their own rules or to refrain from scamming their captive audience. The same thing is true for regular players with varying degrees of time or skill. If someone has more time to devote, they can possibly excel beyond what other players with less time can compete with. If the rules allow varying play time, but disallow gold farming strategies, then to do so may be breaking the rules but there is nothing fundamentally improper about using that strategy. Again these exact criticisms can be likewise directed towards other non-farming players. They also tend to camp good spots, and get in the way, and of course their progress likewise can increase the demand for items or goods in the world. In both situations, there is no difference between farmers and other players, they both have generally the same effects and should be held to the same rules. Unless someone is griefing or hacking, shouldn’t they be free to play, even if its an inconvenience to you?